Unless you live with or interact regularly with someone who is blind, it is easy to forget the difficulty everyday life poses for him or her. I do not know any blind people. A lot of effort has been put forth to help facilitate those who are severely sight impaired or totally blind. Helen Keller is probably the most well-known blind person (she turned out to be an outspoken Socialist Party member - ugh), but I think of Ray Charles when the subject arises. Melanie and I visited the Florida School for the Deaf and Blind while in St. Augustine a few years ago, where we learned Mr. Charles was fortunate to have attended as a child. His rendition of "America the Beautiful" is by far my favorite. 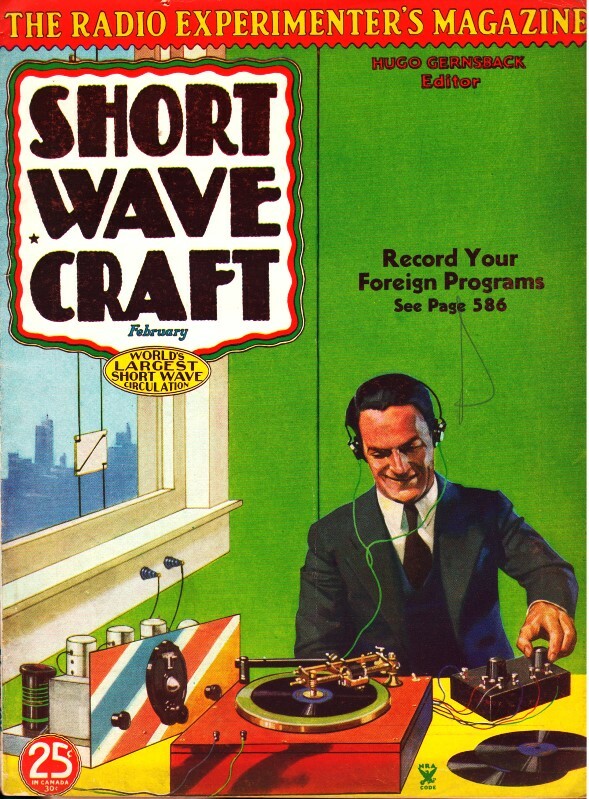 This article from a 1935 edition of Short-Wave Craft reports on efforts to make the electronics trade accessible to blind people via, in this case, pseudo-Braille versions of schematics. Although theoretical design and analysis activities were possible, the potentially lethal voltages present in any vacuum tube circuit presented insurmountable hazards to hands-on practice. There have been occasional news stories recently about products attempting to bring high technology devices into the realm of blind people; e.g., a Braille smart phone. A Technology Resource List is provided by the National Federation of the Blind. Distributors like Enable Mart sells products specifically designed for sight impaired and blind people. The diagram at the shows the very latest in Textbooks for the BUnd­a treatise on radio operat­ing recently compiled in the Braille System, in which the lines of the diagram repre­senting the wires etc.,· are represented by raised dots. Radio operating lends itself peculiarly to those so unfortunate as to have lost the use of their sight. 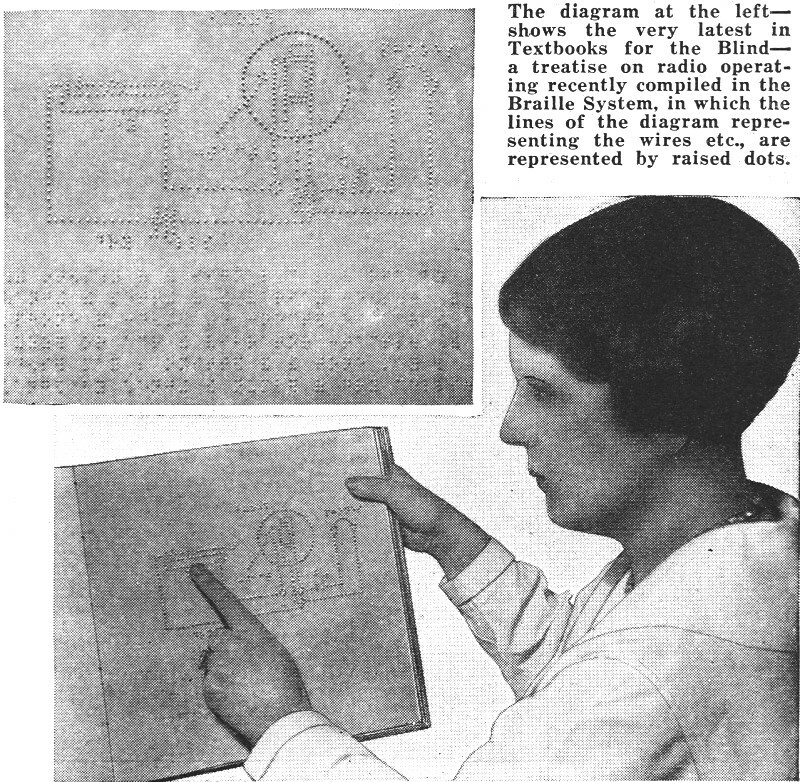 However, it was not possible up until recently for a blind person to study radio diagrams or hook-ups, but thanks to the efforts of the American Red Cross, a new book on radio operation has recently been compiled in the Braille or raised letter alphabet, the dia­grams being formed by a series of raised dots as shown by the accompanying picture. Thus, it is now possible for a blind student to read all about vacuum tubes, oscillations, hook-ups for various types of receivers and transmitters, how the vacuum tube operates and why, etc. Blind students may, of course, be taught the operating code of dots and dashes with comparative ease, through the sense of hearing, but-as afore­mentioned-until this new book had been com­piled there was no treatise on radio available in the Braille alphabet. This alphabet has special characters and one has to learn it the same as a child learns its A.B.C.'s. It is surprising how rapidly a person can read a sentence or page printed in the Braille raised letter system, when they have be­come proficient at it. The diagrams, of course, lend themselves to rapid reading by their very nature, the highly trained supersensitive fingers of the reader following along the lines very easily and rapidly. The names of the various parts of an apparatus, or connections in the cir­cuits, are placed alongside each respective part of the diagram, so that as the student runs his fingers over the wire represented by the series of raised dots he will also notice and interpret the letters or name, which may be found ad­jacent to the respective parts. Ray Charles Sings "America the Beautiful"